The first day of May is tomorrow, aka – May Day. When I was young, I used to make up baskets full of candy and flowers and leave them on friends doorsteps. I always thought it was such a loving and pleasant holiday, a day to be kind. May Day marks the official end of winter and is a celebration to welcome the sun. Say hello to Spring, say hello to flowers, say hello to picnics, to playing outside and wearing dresses. Say hello to the sun. Happy May Day!! Happy almost May Day!! 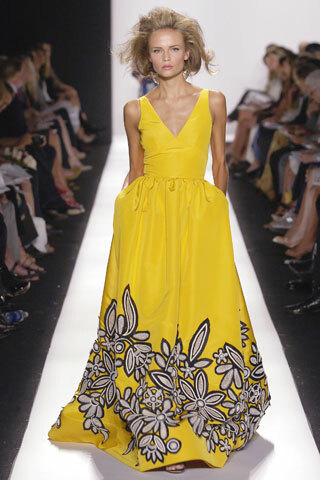 I can’t decide if I like the Nina Ricci or Oscar De La Renta dress better…. I love yellow. I really should add it to my wardrobe. I think I’d look okay in it. The Holly. THAT one is THE one! Love it! I am torn between the first and third! They are both so cute!